President Barack Obama has spoken by phone to Iran’s President Hassan Rouhani – the first such top-level conversation in more than 30 years. Barack Obama spoke of a “unique opportunity” to make progress with Iran’s new leadership, amid a flurry of diplomacy over its nuclear programme. Earlier, Hassan Rouhani said Iran was keen to reach a deal soon. Hassan Rouhani also asserted that Iran did not seek a nuclear bomb, as Western powers have long suspected. Describing meetings at the UN this week as a “first step”, he said he believed the nuclear issue could be settled “within the not too distant future”. Hassan Rouhani said initial discussions had taken place in an environment that was “quite different” from the past. On his arrival back in Tehran from the UN General Assembly forum in New York, Hassan Rouhani was met by a number of key political figures, as well as both supporters and opponents from the public. A New York Times reporter described the scene as chaotic, with dozens of hardliners hurling eggs and shoes at the president’s convoy. 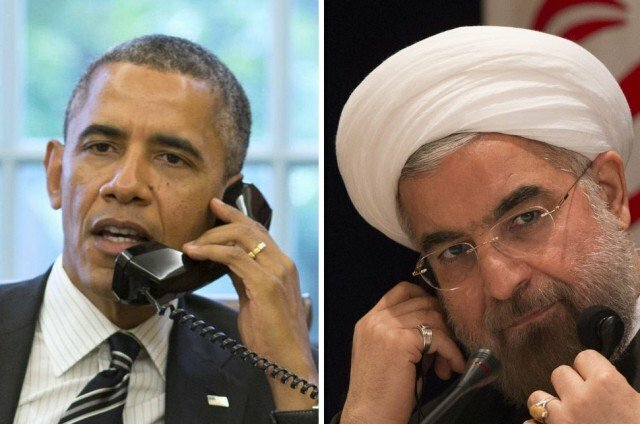 The call with Barack Obama was made just before Hassan Rouhani left New York, where he has been attending the annual summit of the UN General Assembly, Iranian news agency Irna said. White House officials described the 15 minute conversation – apparently initiated by Hassan Rouhani – as cordial. Barack Obama raised concerns about American prisoners in Iran, but the bulk of the call was about efforts to reach a solution on the nuclear issue, she says. Hassan Rouhani, who is regarded as a moderate and was elected in June, has said he wants to reach a deal over the nuclear issue in three to six months. The president says he is fully empowered by Iran’s Supreme Leader Ayatollah Ali Khamenei to negotiate. Hassan Rouhani said he wanted a deal “within a very short period of time”.